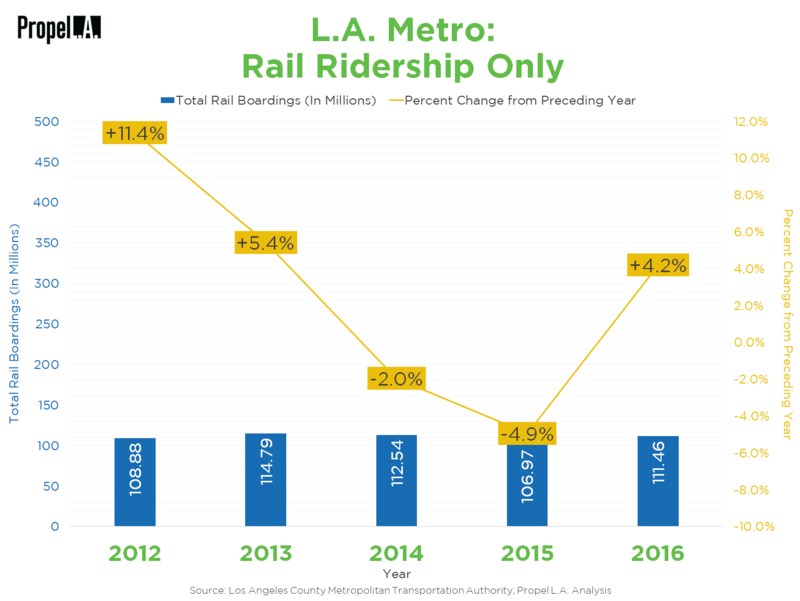 L.A. Metro Ridership | Propel L.A. 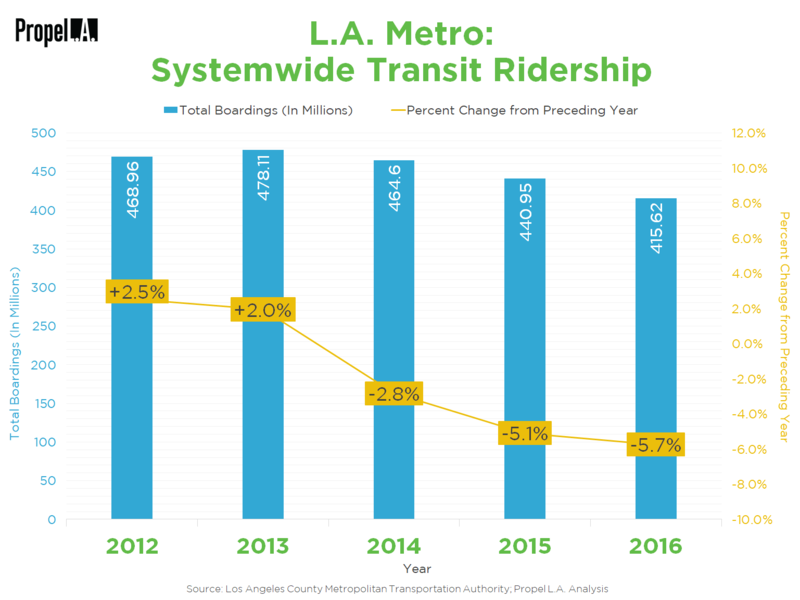 Despite the increase in L.A. Metro (Los Angeles County Metropolitan Transportation Authority) transit ridership from 2012 to 2013, the subsequent decrease in ridership from 2014 to 2016 resulted in a net decrease in ridership in 2016 from 2013. Following the opening of the Expo Line from 7th/Metro Center to Culver City and the Orange Line extension from the existing Canoga station to Chatsworth in 2012, both rail and bus ridership increased in 2012 and 2013. The correlation between rail and bus ridership is usually positive, because many transit riders transfer from train to bus and vice versa. 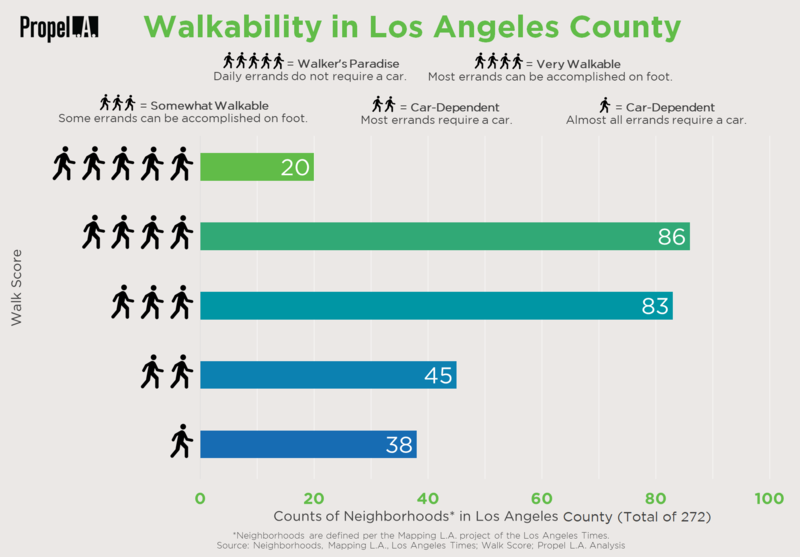 However, transit ridership plummeted in 2014 and 2015 possibly due to chronic tardiness and unreliability (Southern California Public Radio, February 2015). Following the opening of the Foothill Gold Line extension from the existing Sierra Madre Villa station to Azusa and the Expo Line extension from the existing Culver City station to Downtown Santa Monica in 2016, a unique trend emerged where rail ridership increased while bus ridership continued to drop. Most of transit ridership is comprised of bus ridership, thereby consequently reducing the overall number of transit ridership in 2016. Ethan Elkind, the author of Railtown in which describes the history of Los Angeles’s rail system, revealed to the LA Weekly that the recent addition of rail stations and mileages may have usurped the bus system (January 2017). 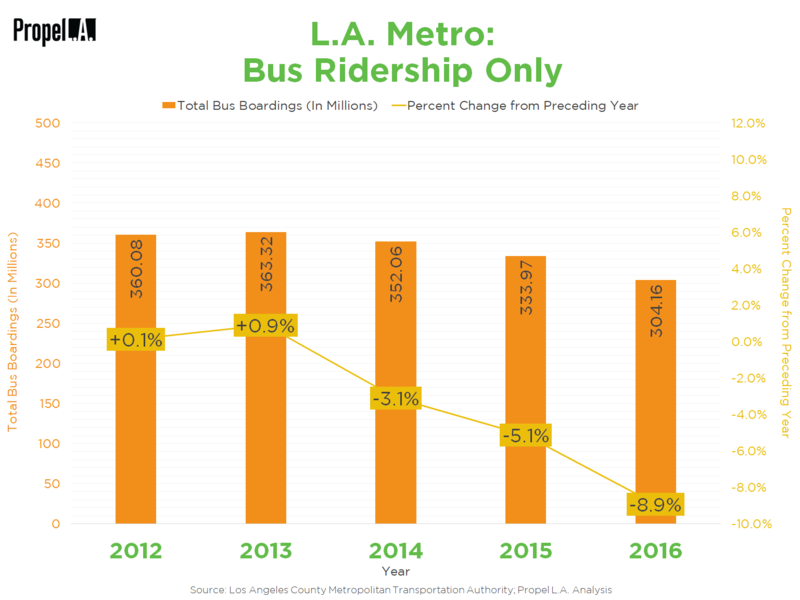 In the same article, L.A. Metro spokesman Kim Upton cited several factors for the sharp decrease in bus ridership: lower gas price, the passage of AB-60 in which allows undocumented immigrants to apply for a California driver’s license, and the growing popularity of transportation mobile apps such as Lyft and Uber.